Prosecutors say they think the disappearance of 12 youngsters from a Mexico City bar two weeks ago was linked to gang rivalry. The 12 were reported missing after they failed to return home from a visit to the Heaven bar on 26 May. Surveillance footage shows a number of them being led from the bar by men in civilian clothes and getting into cars. Relatives say the police have turned a blind eye to the case because the missing come from a rough area. The surveillance footage, screened by prosecutor Rodolfo Rios at a news conference, shows several small cars pulling up outside the Heaven bar in Mexico City's popular Zona Rosa entertainment district. Some of the missing can be seen being led to the cars two at a time. There is no obvious sign of force and the men are not masked and do not seem to be carrying weapons. The footage contradicts a statement given by one man who claimed to have been at the bar with the youngsters. The man said masked gunmen stormed into the Heaven bar at 10:00 on Sunday, seized the group of 12 youngsters at gunpoint and bundled them into SUVs. But police had already cast doubt on the man's statement after he had been found to have provided officers with a false name, telephone number and address. Police said they had been able to determine that eight of the 12 people reported missing had been at the Heaven bar, which caters to revellers who want to continue partying after the city's nightclubs have closed. It is not clear if the remaining four ever were at the bar or what their current whereabouts may be. The surveillance footage shows at least 17 people and 8 vehicles involved in the abduction. Mr Rios said one witness had said that the abduction was linked to rivalry between the Union and Tepis gangs, engaged in drug-dealing in the Tepito neighbourhood of Mexico City. All of the missing are from Tepito, with three of them related to jailed crime bosses from the area. Police are investigating whether the abduction could be related to the fatal shooting of a Tepito man two days before, in front of another bar in the Zona Rosa. News of the two events has stirred concern that a crime cartel calling itself the Knights Templar may have expanded its operations to the capital. 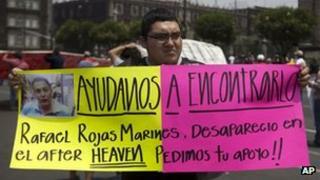 But Mexico City Governor Miguel Angel Marcera denied the disappearances and the shooting were a sign that cartel violence was spreading to the capital. "What we have in Tepito are outbreaks of violence by street gangs," he said, pointing out that there had been such outbreaks in the past. An estimated 70,000 people have died in drug-related violence in Mexico over the past six years, much of it committed by powerful drug cartels. The violence has mainly been concentrated in the northern states bordering the United States and in the west, with the capital largely spared.